Welcome back to the Inlander staff's semi-regular rundown of the cool and worthwhile things we've been into lately: words we've been reading, shows we've been watching, music/podcasts we've been listening to, and tasty treats we've been drinking/eating. This week, we're telling you about the coolest, nerdiest games we've been wearing down our thumbs playing. Find past installments of "What We've Been.." here. Every so often, I go on a hyper-focused game binge on my phone, playing the same app during every spare minute until I get completely sick of it and swear off phone games, for at least a few more weeks. When I do play, I gravitate toward games that are simple enough I can almost meditatively play them while watching TV or before I fall asleep. 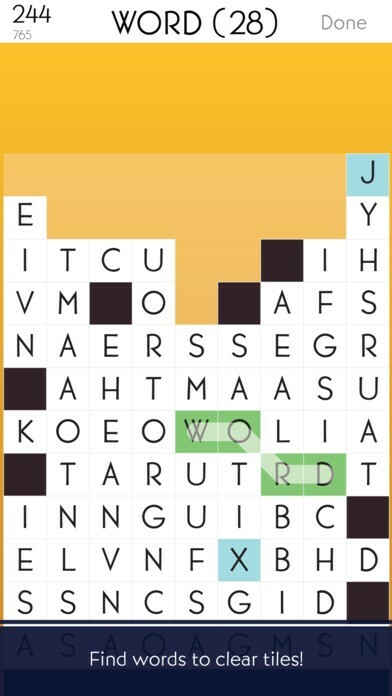 Recently I came back to a solid standby that’s been on my phone for a few years: SpellTower. In a nutshell, you connect letters from a seemingly random jumble to create words. The longer and more complex the word, the more points you get. The game has a few modes — you might be trying to prevent your stacks of letters from reaching the top of the screen, or you might just be trying to get the most points from a single dwindling stack. Lately, I’ve been playing Jackbox games with friends at my house. Jackbox makes games you can play with people in the same room as you using your phone or tablet. Some games steal the format from board games (Cards Against Humanity comes to mind) but there are also trivia games for people into that sort of thing. 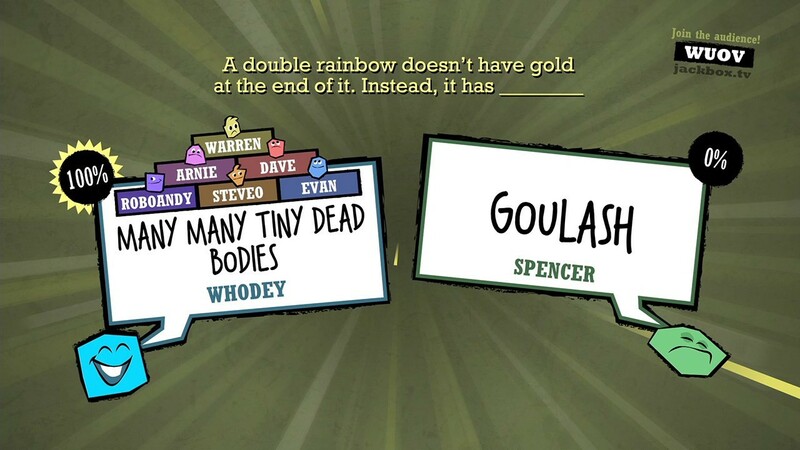 Quiplash from Jackbox games is like a digital version of "Cards Aganist Humanity." For me, Jackbox games can be a great thing to do when I don’t really feel like doing much. It’s the best of both worlds: I can interact with people in the same room as me while staring at my phone the whole time. I seriously cannot stop obsessing about this game. Years and years in the making, the fourth title by San Diego studio The Behemoth is finally here, offered as an early access game for Steam and Xbox One users. I first tried Pit People more than three years ago as an attendee of the big Seattle gaming convention PAX West, before the game even had a title. I waited in a long line only for the convention hall to close five minutes after my demo started. I left feeling disappointed and like the gameplay — turn-based strategy combat — wasn't for me. The Behemoth's beloved story-driven beat-'em-up Castle Crashers had set high expectations, after all. Pit People's kobolds (right) are my absolute favorite class. Aren't they just so cute and stabby?! And then, when it launched in early access last month, Pit People blew every previously held expectation or idea I'd had straight out of the water. Everything about this game now speaks to me in a special language all its own: the art style, goofiness, character classes (#KoboldsFTW!!! ), voice acting, story modes, arena battles, character accessory upgrades and the gameplay itself. I'm not just riding the Pit People fanwagon (in the game, you actually maneuver around the map in a little covered wagon, equipped with cannons to stun roaming baddies), I'm driving it and telling everyone I know to get on in. I'm not the most dexterous gamer, and this is where Pit People stands apart. As a turn-based strategy game, players move their team's (there are six total team slots; various character classes take up one, two, three or half of a slot) members around the hex-tile field to optimize offensive and defensive moves, which then auto-play on the screen after the teams are locked in place. With online versus and local co-op modes, battle solo, with or against a friend, and optimize your teams' make-ups with a mix of Pit People character classes: Smash face in melee combat with cyclopes and hair trolls. Heal low-health allies with cupcakes that fling their own frosting to boost nearby friendlies. Fire off explosive ranged attacks with human archers and explosive unicorn horns. Buff your team with a tuba-playing mascot, or poison everyone around you with a mushroom's purple fart clouds. Swarm fleeing enemies with zombies, troll babies and kobolds. Hollow Knight understands what’s beautiful about getting lost. That’s the first thing to understand. Most games just hand you a map, and watch as you dutifully fill it in while exploring. Not so with Hollow Knight. As you the player, a heroic bug, slash through the world of Hollow Knight with your tiny nail, you don’t always know exactly where you’re going. It’s only once you find another bug, a cartographer scribbling away somewhere in each level, that you can buy a map to navigate by. Each new area you discover, it’s the same way: You’re lost until you find the cartographer. In so many games, this would be maddening. But not here. The game is so pretty — with a gorgeously-rendered art style that looks a bit like Tim Burton crossed with Hayao Miyazaki— that getting lost feels almost meditative. It has the feeling of discovery. You’ll find windswept cliffs and somber temples and overgrown gardens and mines gleaming with pink crystals. And you’ll have plenty of time to appreciate the scenery. When you die — and you will, often — you’ll often be set back quite far. You’ll have to survive long enough to fight your way back to your body, and defeat the manifestations of your own lingering regrets to reclaim your hard-won cash. Most games bless you with an initial flurry of upgrades — you may start out weak, but a few levels in and suddenly you’re firing rockets and performing triple-backflip slashes. Not so with Hollow Knight. Adding one more health point can take hours. Simply getting the ability means descending down, down, down, past the caverns full of jellyfish with explosive cores, through the Fungal Caves patrolled by living mushrooms, and then up, up, through a towering cathedral — fighting winged bugs tossing javelins at you in mid air — and into the Soul Sanctum where you battle a wicked-hard boss. And only then, once you’ve defeated him, can you smash down to the ground. This game is hard. It’s often frustrating. But that’s what it makes it feel so satisfying. Take the fight against the three Mantis Lords that rule the fierce praying mantis warriors in the depths of the Fungal Caves — you will die the first time. And the second. And the seventh and the eleventh. But eventually, the lessons of all your failure are forged into your muscle memory. Patterns of movement become second nature. The Mantis Lord stabs downward — you dodge sideways and slash at his side. He blitzes forward and you leap over his head. He flutters up to the side of the wall and tosses a glimmering disc at you, and you dash over it and then under it when it flies back.